We've done the research, so you don't have to! We have the gutter guards you need from economical gutter screens,to hybrids, to durable guards that are scientifically tested and proven to keep debris out of your gutters!!! We are your one stop shop for Gutter Guards!!! We are your one stop shop for Gutter Protection! Whether you are looking for gutter screens, gutter guards, gutter hoods, gutter helmet, gutter covers, or gutter inserts we have the gutter protection systems that you need. Rain gutters can’t do their job if they aren’t kept clean. Leaves, pine needles, seeds and other debris can clog your gutter system. Rotten wood, leaky basements, frozen walkways and annoying drips are just a few of the problems you could face when your gutters get clogged. But cleaning your gutters is a time consuming, messy job. You need to be fearless of heights, have a good ladder, hand tools to scoop out leaves, and a garden hose to flush your gutters. You may also need a plumber’s snake to clear clogs in your downspouts. At the very least, you should clean your gutters at least twice a year, once in the Fall and once in the Spring. This is a general guideline, though. If you live in a wet climate or have tall trees next to your house, you will need to clean out your gutters more often. Installing a gutter guard is a better option. They provide peace of mind and keep you and your loved ones from risking life and limb when climbing ladders. One popular type of gutter guard is the gutter screen. Screening has been around for a long time and there are different types of gutter screens available for different types of gutter systems. Plastic gutter screens and metal gutter screens are the two most common materials used for screening. Gutter screen systems are often the least expensive and easiest to install of all the gutter guards, but - depending on their mesh size - may still allow some seeds and buds to get into your gutter. There are many metal screens to choose from including – hinged gutter screens for half round gutters (also available in copper, durable steel gutter screens for areas in snow country, and the contractor favorite, drop in screens for standard K Style Gutters. Another popular type of gutter guard is the gutter cover. These surface tension systems look like caps or covers that go over your gutters. 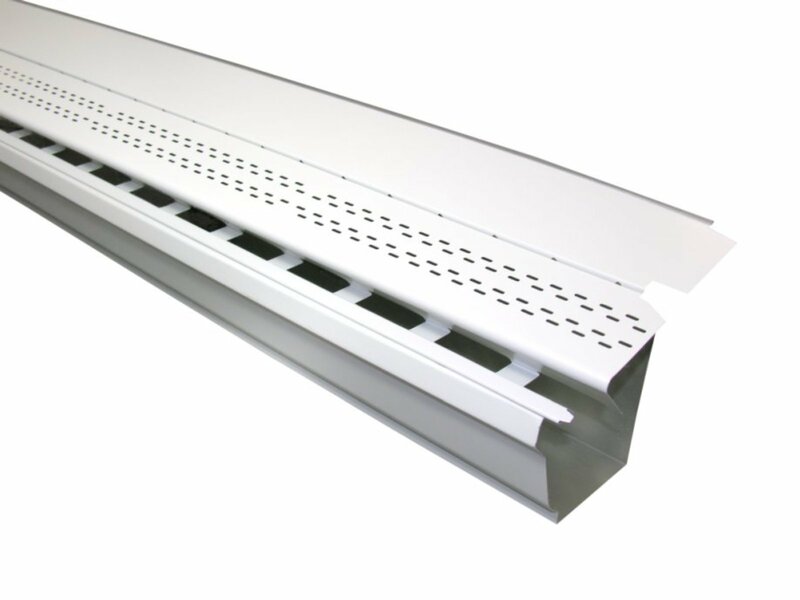 These gutter covers typically include a slot or trough along the front edge of the cover. As water flows from the roof and over the gutter cover, surface tension makes the water follow the curve of the cover and flow into the slot (which leads into the gutter), a path that most debris cannot follow. 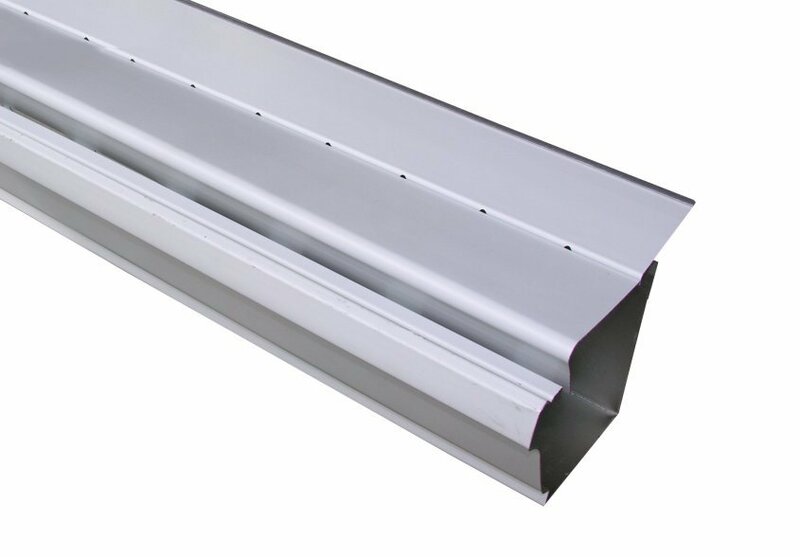 When choosing a gutter cover system, make sure you find one that is easy to install and easy to remove – as it will be necessary to clean out the gutters once every few years. 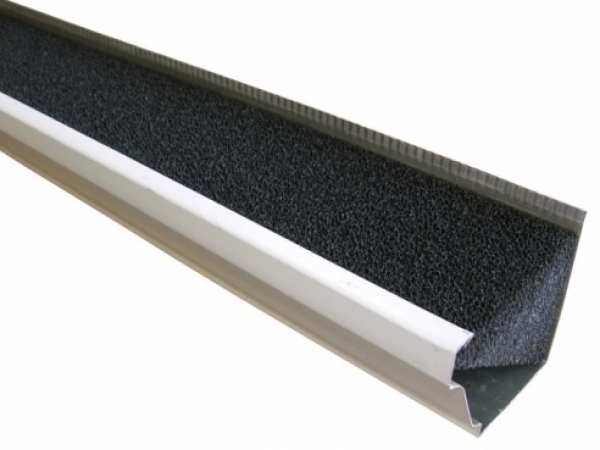 Foam gutter filters work on a different principle, filling your gutters with a water-permeable foam insert. Foam Leaf Defier Gutter Filter wards off small seeds and buds that might slip through other types of gutter guards. But make sure the foam is treated to resist mold and repel insects. It should also be treated with a fire retardant. The gutter filter systems are available for both k style and half round profiles and are a great cost alternative for copper gutters since there is no electrolysis between the foam insert and the copper. Hybrid gutter cover systems combine aspects of gutter screen and gutter cap systems, often featuring a finer mesh than most screen systems. The covers aren’t completely solid and have small openings that allow the water to flow in – but are not big enough to allow the debris to enter the gutter. These hybrids vary from ones with slots, holes and extremely fine screen. Many gutter contractors believe these hybrid gutter covers to be the most efficient systems in deterring clogged gutters. In addition to the gutter guards, it’s also a good idea to put leaf strainers over the openings to your downspouts. Wire strainers, as they are generally known, keep the leaves from clogging your downspouts and/or underground drainage. The answer depends on your specific situation. Are you comfortable on ladders? Do you have the necessary time? Can you find someone that you can rely on (and who has insurance) to keep your gutters clean? Surface tension systems are usually more expensive than gutter screens, and hybrid systems can be the most expensive. But prices will vary and you may be able to get a good deal on a more advanced system. Consider the types of treesaround your house. Pine trees pose a bigger problem than deciduous trees, since their needles are smaller than leaves. Also note that not all gutter guards are compatible with all types of roofs and gutters. 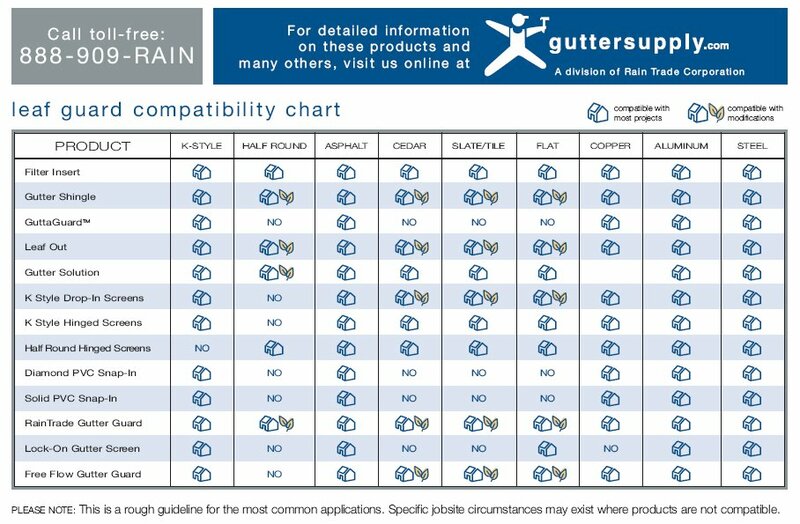 See this chart (www.guttersupply.com/file_area/public/File/leafguardcompchart.jpg) to tell which brands will work for your roof. Finally, keep in mind that gutter guards are not foolproof. Some systems, especially the less expensive ones, may still allow small debris to get into your gutters. This may not be enough to clog your gutters, but could lead to a build-up over time. Gutter Covers and Gutter Protection Devices - How Do They Work? 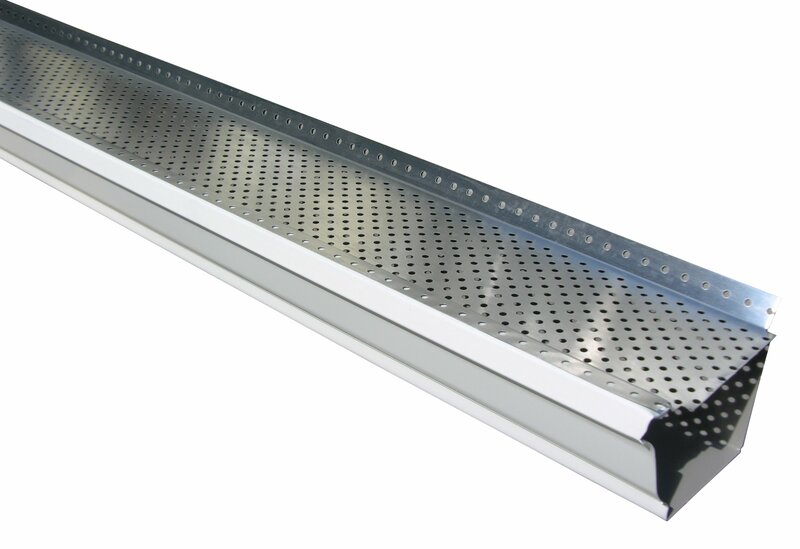 Are Gutter Filters the Perfect Solution? 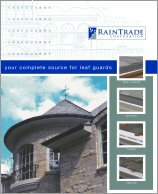 Gutter Guards - What Are They Made Of? Who's Living In Your Rain Gutters?